How Much Does Moving Houses Cost in Melbourne? The cost of moving houses in Melbourne is one of the most important considerations when it comes to planning your move. Whether you choose to hire professional Melbourne removalists or do it yourself, moving houses in Melbourne generally costs in excess of $300.00. Of course, the scale of your move will impact the price of moving significantly; moving out of a 1-bedroom apartment will be a lot cheaper than moving out of a double-storey family home. Typically, all professional removalists in Melbourne calculate fees at an hourly rate of approximately $140* per hour (off peak) which includes two men and a truck. On the same note, if you were to hire your own moving truck, you will pay approximately $70 per hour but will need to find manpower to help you load and unload. Hiring professional removalists in Melbourne can end up costing less than moving without assistance, because movers are trained to work quickly and competently. Choosing professional removalists will also dramatically lower the risk of costly property damage. There are many factors which increase the price of moving home, such as; difficult property access, many stairs, long travel distance from property to property or property to depot, a large number of heavy items and higher amounts of furniture or fragile items than usual. Your removalists should be able to provide a precise quote to avoid any unexpected fees at the completion of your move. Extra services can be provided when you choose an expert moving company in Melbourne. These moving services do incur additional fees, but can be arranged by your Melbourne removalists to make your moving experience as stress-free as possible. How Much do House Movers Cost? Professional removalists in Melbourne exist to provide a hands-on service to those needing assistance moving houses. Shifting homes is not something that you will do frequently, so when the time to move in Melbourne does arise, it is best to employ reputable movers to get the job done right. The cost of hiring house movers in Melbourne is a primary consideration for most people. Surprisingly, most expert removalists charge very similar fees. When gathering quotes for your upcoming relocation, you should ensure that you shortlist companies who are AFRA (Australian Furniture Removal Association) affiliated and reputable in the industry. If you are going to spend money on hiring removalists in Melbourne, you are best off choosing qualified ones for a successful transition. For typical moves, where one truck and two men are required, the cost is calculated on an hourly rate of $140 – $170 per hour* from depot to depot. Variation occurs when factors such as, difficult access to the property, extra staff, weekend schedules or larger than usual loads come into play. Most removalists will require a minimum of 2 hours to move a small apartment, with timeslots of 4-6 hours required for a family home. The best thing you can do to get a clear idea of how much your move will cost is to contact a handful of local removalists to your area, for a no-obligation quote. Good furniture removalist companies will impress you with their efficient follow up, and may even do an online quote for you if required. With most moves costing between $400* – $1500*, it is money well spent. The men employed to lift your items are well trained and strong. Taking on the task of moving without the help of experts can put you at high risk of physical strain, injury and logistical stress. 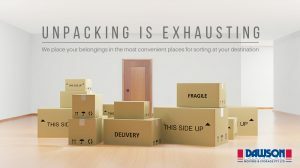 If you want to get a clear idea of what your Melbourne house Move will cost, simply click here for a no obligation quote from Dawson Moving & Storage. Call (03) 9763 0222. * All prices are subject to change, and are dependent on; seasonal variations, difficulty of access to properties, volume and type of goods to be moved, location of properties and individual circumstances.